The Trans-Volga-Kazakhstanian steppe province occupies the area from the lower Volga to the Altai. In this province, the main dominants are bunch feather grasses (Lavrenko 1970 ). In the northern steppes on the chernozem Stipa zalesskii dominates; in the dry steppes Stipa lessingiana ; but in the deserted steppes Stipa sareptana on loamy sands; Stipa capillata and Stipa pennata on sands, and on stony substrates Helictotrichon desertorum. On highly calcareous soils Stipa korshinskyi is typical. The West Kazakhstanian (Ergeninsko-Zavolzhskaya) plain subprovince (Steppes of Eurasia 1991; Rachkovskaya and Bragina, 2012 ) lies in the northern part of the Volga-Ural inter fl uve. The zonal range there is: droughty steppes, temperate-dry steppes, dry steppes and deserted steppes. The vegetation cover is complex. Droughty steppes within the Common Syrt are forb – bunch grass steppes with Festuca sp., Stipa zalesskii, Stipa lessingiana and S. capillata. In the Caspian lowlands the complexes of bunch grass steppes with Artemisia lerchiana and Artemisia pauci fl ora communities dominate. The sagebrush – feather grass (Stipa sareptana) complexes are found in the southern part of this subprovince, especially the communities with Artemisia lerchiana being characteristic of the deserted steppe sub zone. Droughty steppes within the Common Syrt are forb – bunch grass steppes with Festuca sp., Stipa zalesskii, Stipa lessingiana and S. capillata. In the Caspian lowlands the complexes of bunch grass steppes with Artemisia lerchiana and Artemisia pauciflora communities dominate. The sagebrush – feather grass (Stipa sareptana) complexes are found in the southern part of this subprovince, especially the communities with Artemisia lerchiana being characteristic of the deserted steppe sub zone. The Trans-Ural – Turgay subprovince (Steppes of Eurasia 1991; Rachkovskaya and Bragina, 2012) occupies the southern outskirts of the West Siberian Plain, the Sub-Ural and Turgay Plateau of the TransUral denudation plains and the Mugodzhary. A full range of communities of the steppe zone, from rich – feather grass steppes to deserted steppes, is represented. Before plowing the rich-forb – feather grass steppes and forb – feather grass steppes dominated the droughty steppes of the plains, in the north; the fescue – feather grass (Helictotrichon desertorum, Stipa zalesskyi) steppes occur on the slopes of the low melkosopochnik near rivers (Ural). However, most of the subprovince is occupied by the fescue feather grass (Stipa lessingiana, Festuca valesiaca) steppes and xerophytic forb-feather grass (Stipa lessingiana, Galatella tatarica, Tanacetum achilleifolium) steppes, which are currently well under cultivation. Complex feather grass steppes (Stipa sareptana) are distributed in the south. The steppes with Stipa capillata and are very typical for light soils. Also typical is the occurrence of shrub communities of Amygdalus nana, Cerasus fruticosa and Cythisus ruthenicus. At the Sub-Ural piedmont plateau Stipa lessingiana steppes in conjunction with communities of Artemisia pauci fl ora are typical on soils with in fl uence of solonetz. On chalky sediments in this area there are rare sagebrush communities of Artemisia gracilescens and Artemisia lessingiana with Matthiola fragrans, Zygophyllum pinnatum, Scabiosa isetensis and Seseli glabratum, and in the south with Anabasis truncata and Nanophyton erinaceum. Petrophytic bunch grass – sagebrush, sagebrush –bunch grass (Artemisia lessingiana) steppes and brushwoods are characteristic at the low mountains and melkosopochnik of the Mugodzhary. On the Torgai Plateau previously there were huge homogeneous areas of the fescue – feather grass steppes and xerophytic forb – fescue – feather grass steppes, but these are now plowed. Irgiz Plateau. Foto: Smelansky I.E. Torgay Plateau. Foto: Foto Perezhogin Yu.V. Mugodzhar mountains. Foto: Smelansky I.E. Ishkargantau mountains. Foto: Smelansky I.E. In the east there are relic pine forests (Pinus sylvestris) on sand with in fi ltration of boreal elements. The eastern part of the area, impacted by the ancient Turgai run-off valley, is dominated by meadow communities and complex steppes on lake terraces and here, in low-lying depressions, desert vegetation penetrates far to the north. In general the easterly (Kazakhstanian) nature of the vegetation of this subprovince has some features that are transitional to the western Black Sea province. Torgay trough. Pine forest Amankaragay. Foto Perezhogin Yu.V. The West-Central Kazakhstanian Melkosopochnik subprovince (Karamysheva and Rachkovskaya 1973 ; Steppes of Eurasia 1991; Rachkovskaya and Bragina, 2012). 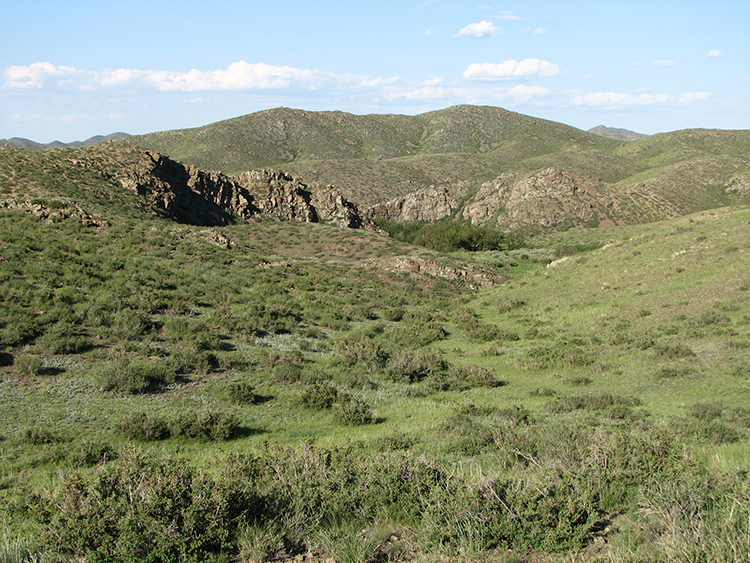 It occupies a lower-lying part of the Central Kazakhstan Melkosopochnik. Here the zonation is: moderately droughty, droughty, moderately dry, dry and deserted steppes. Remarkably, the width of the subzones is about equal. Petrophytic vegetation of cobbly soils and rocky outcrops of different composition and shrub steppes with Spiraea hypericifolia are widespread. In the southern part of the region shrub steppes and brushwoods with Caragana frutex and S. balchaschensis (S. bongardiana in the southwest) are common. In this subprovince, on the plains, the composition of the feather grass steppes is similar to those in the Turgay subprovince. The East-Central Kazakhstanian low-mountain-melkosopochnik subprovince (Karamysheva and Rachkovskaya 1973; Rachkovskaya and Bragina, 2012). The zonation comprises four subzones: droughty, moderately dry, dry and deserted steppes. The zonation pattern is complicated and considerably varied under the in fl uence of low mountains and hills. Within the subprovince, on the slopes of hills and low mountains, the Helictotrichon sp. and feather grass steppes (Festuca sp., Stipa kirghisorum, Stipa capillata) occur. A characteristic feature of the subprovince is the vast expansion of diverse shrub steppes with species of Spiraea and Caragana, including Spiraea trilobata growing on granite. Only in this region, steppes with Caragana pumila are widely represented, and precisely these steppes have a lot of species in common with Mongolian steppes. In the deserted steppes Artemisa compacta can co-occur with A. sublessingina and A. gracilescens. A peculiarity of this subprovince is the occurrence of a vertical zonation of vegetation on slopes of low mountains in which forest-steppe landscapes occur on the Kokchetav Uplands and northern forb – feather grass steppes are found on the slopes in the dry steppe subzone. On low mountains the petrophytic rich-forb – Helictotricon desertorum and the special meadow petrophytic-forb – sedge grass steppes (Carex pediformis) with high-mountain elements are well represented. Betula and Populus forests also occur on the low mountains, and unique pine (Pinus sylvestris) forests and woodlands are linked with the granites. Kazakh Uplands. The Bosaga River Valley. Foto: Smelansky I.E. Kazakh Uplands. Okpekty. Foto: Smelansky I.E. Kazakh Uplands. Chingiztau mountains. Foto: Smelansky I.E. The Irtysh-Kulunda plain subprovince (Rachkovskaya 2006; Rachkovskaya and Bragina, 2012). This subprovince is represented only in the western part of Kazakhstan. A striking feature here is the unique steppe with the tall umbellate Peucedanum morisonii, but unfortunately, it is largely destroyed on the plains. The steppes with Stipa capillata, sandy feather-grass (Stipa pennata) and fescue (Festuca beckeri) steppes dominate the dry steppes on loamy sands and sands along the right bank of the Irtysh River. Also forest belts of Pinus sylvestris are typical on the sands.